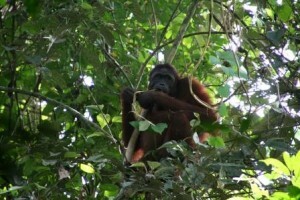 The Mount Palung National Park is located in the province of West Kalimantan and comprises an area of 90,000 ha. The site encompasses a broad range of forest habitat ranging from coastal beach and mangrove forest to untouched mountain forests on the slopes of the Gunung Palung (1116 m) and Gunung Panti peaks. Peat and freshwater swamp forest and highly endangered lowland dipterocarp forests ring is the base and lower slopes of the isolated Palung Mountain massive. Potential of natural beauties which make this region has the special attractiveness is the existence of the complete types on ecosystem. In each type of that ecosystem is inhabited by various kinds of wild animal, among them is primate family such as orangutan, gibbon, proboscis monkey, leaf monkey and long tail macaque. These animals are often found on tree’s canopy. Another treasure is the unique flora of this National Park named Black Orchid. The orchid species can live on lowland only, with height 0 -100 meters above sea level, and generally grow in riverbank. Its power of attraction is on the flower form – has green stem, which combined of black pockmarked in the middle of the flower. Meet at airport and directly transfer to hotel. In the afternoon, we can visit the monument of equator. Free at your own leisure. Pontianak is the capital of West Kalimantan, located precisely on the equator and lies on the delta of Kapuas River, the longest river in Indonesia.